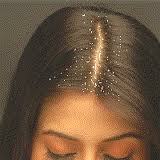 Dandruff is the single most common problem that can occur on every body. To have a few white-flaked cells is normal for it is simply the sloughing off matured skin cells and waste material through the pores of the scalp. It is only when this becomes excessive that it has to be considered a problem. Well-looked after, clean, healthy hair with the proper acid balance does not have problem dandruff. A scalp rinse made from a teaspoon of potassium chloride and six cups of water, heated until dissolved. Add about four ounces of Celandine chopped and boil the solution for 15-20 minutes. After straining the leaves, simmer until mixture is reduced to 1.5 cups of liquid. Add in about half a pound of glycerin and reduce again until there are 2 cups remaining. Strain and store the solution in a cool place. Rinse hair daily to reduce and eliminate dandruff. Massage and daily brushing is extremely helpful in treating dandruff. They invigorate the blood circulation to scalp, promote the traffic of oil effusion and dislodge the dead skin cells sticking to the scalp for easy exfoliation. If you have dry dandruff, use an oil to massage your scalp especially before washing your hair. To a mug of water, mix two tablespoons of malt vinegar. After shampoo, rinse the hair with it. Towel-dry your hair. This is an excellent remedy to prevent oily dandruff. Soak two spoonfuls of fenugreek(methi) seeds in water overnight. In the morning, make a paste of the seeds and apply on the head. Leave it on for half an hour. Then wash the hair with soapnut (reetha) or shikakai and water. You may use a herbal shampoo instead to wash your hair. Do this routine twice a week. For best results, massage your scalp with 1 teaspoon hot castor oil, 1 teaspoon coconut oil and 1 teaspoon sesame (til) oil. Leave it on for about half-an-hour and then shampoo it out. Follow this routine, twice a week, especially in winter. Take about 5 tablespoons of yogurt and squeeze half a lime in it. Take two spoonsfull of green grams and powder them. Mix it in curd. Apply on scalp and leave it for ten minutes. Wash your hair with a creamy shampoo thoroughly. Follow this routine at least once a week. Boil a handful of neem leaves in 4 teacups of water. After cooling and filtering, use for rinsing hair. Using limejuice to wash hair.